The ankle-brachial index (ABI) is an efficient tool for objectively documenting the presence of lower-extremity peripheral arterial disease (PAD). [1, 2, 3, 4] It is a simple, reproducible, and cost-effective assessment that can be used to detect lower-extremity arterial stenosis in the primary care setting, as well as to identify patients at increased risk for lower-extremity arterial injury after penetrating or blunt trauma. Further information on the use of the ABI is available in the PAD management guidelines developed by the American College of Cardiology (ACC) and the American Heart Association (AHA). Patients who are unable to remain supine for the duration of the examination are not candidates for an adequate ABI. 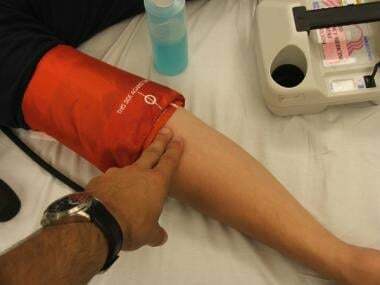 ABI measurement is also contraindicated in a patient in whom the use of an occlusive sphygmomanometer cuff may worsen the extremity injury. No anesthesia is recommended. 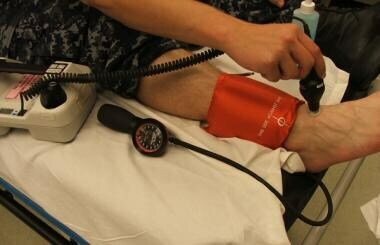 Any form of sedative or anesthetic may affect the blood pressure measurement and thus reduce the accuracy of the ABI. The patient should lie on an examination table in a supine position. An ABI of 0.91-0.99 is considered borderline. The patient may be asymptomatic at rest but may experience symptoms related to the compromised vascular flow when ambulating. An exercise test may help evaluate a patient who has borderline ABI results. An incorrectly performed test may lead to a false negative or a false positive result and thereby delay the diagnosis or prompt unnecessary further testing. A false negative ABI result may occur in patients with noncompressible arteries—that is, a heavily calcified lower-extremity vessel may artificially elevate ankle pressure measurement. Pick appropriately sized cuff on basis of width of lower extremity. 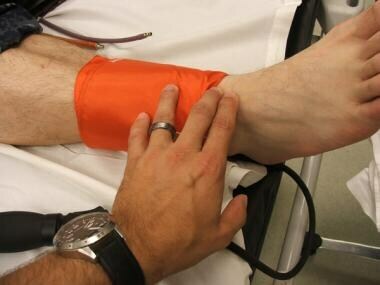 Make sure that cuff completely encircles lower extremity. Make sure you have appropriately sized upper-extremity cuff. Note that patient is in supine position. 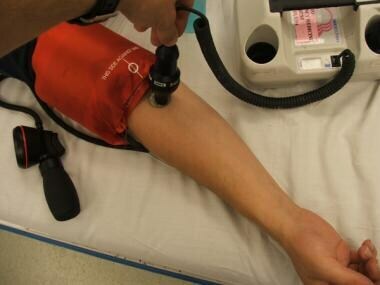 Obtain the brachial systolic pressures of both arms (see the images below), and choose the higher of the 2 values as the brachial systolic pressure (the difference between them should be less than 10 mm Hg). The brachial pulse is best appreciated on the medial side of the antecubital fossa. Do not obscure artery with cuff; you will need to be able to palpate artery and/or locate it with Doppler device. As with each appropriately identified arterial site, mark site with ultrasound transmission gel after palpation. Locate artery with device. Typically, Doppler probe must be positioned at 45-60 degrees, not at 90 degrees as shown. Obtain the anterior tibial and posterior tibial systolic pressures of the extremity in question (see the images below), and select the higher of the 2 values as the ankle pressure measurement. The posterior tibial pulse is best appreciated just dorsal and inferior to the medial malleolus. The dorsalis pedis pulse is best appreciated on the dorsum of the foot between the proximal section of the first and second metatarsals, usually above the navicular bone. Palpate artery. Dorsalis pedis is palpated by hand before Doppler device is used. Place small amount of ultrasound transmission gel at landmark where artery was located. 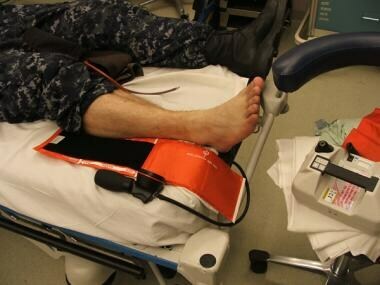 Locate artery with Doppler device. Posterior tibial artery is located and marked with gel. Identify artery with Doppler device. 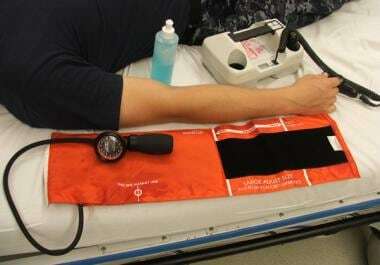 Upon application of Doppler probe, arterial pulsations should be audible. If they are not, reposition probe until appropriate sound is obtained. 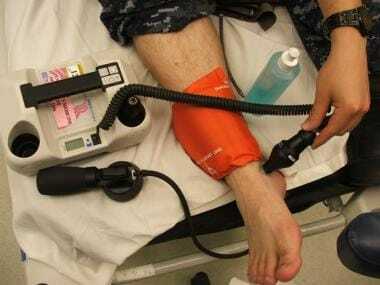 Finally, divide the ankle pressure by the brachial artery pressure; the result is the ABI. Lange SF, Trampisch HJ, Pittrow D, et al. Profound influence of different methods for determination of the ankle brachial index on the prevalence estimate of peripheral arterial disease. BMC Public Health. 2007. 7:147. [Medline]. Shanmugasundaram M, Ram VK, Luft UC, Szerlip M, Alpert JS. Peripheral arterial disease--what do we need to know?. Clin Cardiol. 2011 Aug. 34(8):478-82. [Medline]. Davies JH, Kenkre J, Williams EM. Current utility of the ankle-brachial index (ABI) in general practice: implications for its use in cardiovascular disease screening. BMC Fam Pract. 2014 Apr 17. 15:69. [Medline]. Rac-Albu M, Iliuta L, Guberna SM, Sinescu C. The role of ankle-brachial index for predicting peripheral arterial disease. Maedica (Buchar). 2014 Sep. 9(3):295-302. [Medline]. Yao ST, Hobbs JT, Irvine WT. 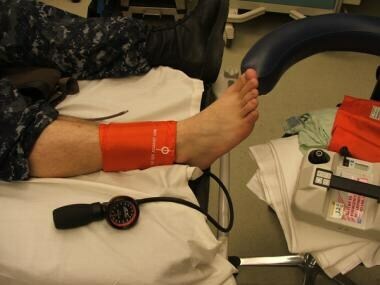 Ankle systolic pressure measurements in arterial disease affecting the lower extremities. Br J Surg. 1969 Sep. 56(9):676-9. [Medline]. Ouriel K, McDonnell AE, Metz CE, Zarins CK. 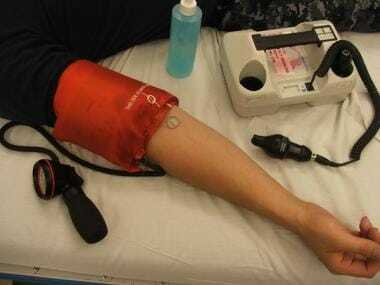 Critical evaluation of stress testing in the diagnosis of peripheral vascular disease. Surgery. 1982 Jun. 91(6):686-93. [Medline]. Johansen K, Lynch K, Paun M, Copass M. Non-invasive vascular tests reliably exclude occult arterial trauma in injured extremities. J Trauma. 1991 Apr. 31(4):515-9; discussion 519-22. [Medline]. Newton EJ, Arora S. Peripheral vascular injury. Marx JA. Marx: Rosen's Emergency Medicine: Concepts and Clinical Practice. 7th ed. Philadelphia: Saunders Elsevier; 2009. Vol 1: Part II - Trauma. Hiatt WR. 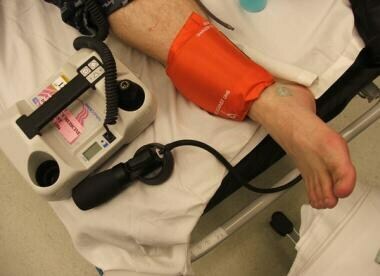 Medical treatment of peripheral arterial disease and claudication. N Engl J Med. 2001 May 24. 344(21):1608-21. [Medline]. Bailey MA, Griffin KJ, Scott DJ. Clinical assessment of patients with peripheral arterial disease. Semin Intervent Radiol. 2014 Dec. 31(4):292-9. [Medline]. Hirsch AT, Criqui MH, Treat-Jacobson D, et al. Peripheral arterial disease detection, awareness, and treatment in primary care. JAMA. 2001 Sep 19. 286(11):1317-24. [Medline]. Sansosti LE, Berger MD, Gerrity MA, Kelly P, Meyr AJ. 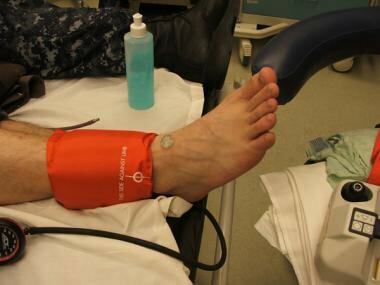 Effect of patient positioning on toe pressure measurement using noninvasive vascular testing. Br J Community Nurs. 2015 Sep. Suppl Wound Care:S12, S14-6. [Medline]. Saber R, Liu K, Ferrucci L, et al. Ischemia-related changes in circulating stem and progenitor cells and associated clinical characteristics in peripheral artery disease. Vasc Med. 2015 Dec. 20(6):534-43. [Medline]. Husmann M, Jacomella V, Thalhammer C, Amann-Vesti BR. Markers of arterial stiffness in peripheral arterial disease. Vasa. 2015 Sep. 44(5):341-8. [Medline]. Ferket BS, Spronk S, Colkesen EB, Hunink MG. Systematic review of guidelines on peripheral artery disease screening. Am J Med. 2012. 125 (2):198. [Medline]. The authors would like to thank the Naval Medical Center Portsmouth for its contributions, as well as the staff of this facility. Most importantly, the authors would like to thank the Corpsmen of the United States Navy, the Emergency Department Corpsmen, and HM1 Lee for his contributions as a leg and arm model. Ankle Brachial Index Measurement in Primary Care Setting: How Long Does It Take?